and follow the step by step instructions or watch the video. How many of each shape? How many sides in the Ninja Star? How many vertex in the Ninja Star? How many sides in the Octagon? How many vertex in the Octagon? This is a great maths warm up activity and can be set to suit any stage. Grab the white boards and beat the clock. This is a visual aid designed to be projected onto a white-board for whole class exposition. The calculations are generated randomly and you can vary the type of calculations that will appear. Use the slider above to vary the time the calculations remain on the screen. TIMES TABLES SONG here's a great video to start the day with some times tables memorising. Maths Chase is a completely free site where you can quickly test your times tables. The site is a very simple game but kids find it a really fun way to learn their times tables. MATH MAGIC Spelling -VSauce a great magic trick with lots of maths you will need a pack of cards. Great for Stages 2 and up. Watch the video do the maths and go WOW! A fabulous strategy for helping your kids develop number sense is by engaging in Number Talks. THE PROBLEM mentioned in the video is 5 x 18 this is discussed in the Maths Talk and student's strategies illustrated on the whiteboard. An amazing array of mathematical thinking. A Fabulous maths puzzle, which will test your number sense and problem-solving skills. It can be either addition or multiplication. give the sum or product shown in each row or column. The Japanese word Yohaku means white or empty space. And I love to fill in empty spaces. LEARN How to solve a Yohaku puzzle. We have been playing around with these for a few days and have absolutely loved them, they are quite addictive. The mathematical discussions taking place are amazing. The strategies, solutions and techniques so varied. Guess and check, start with the top corner, find the common factors, look for patterns. See how you go with the ones below. FLEXTANGLES are soooo!!! cool Splendid maths fun. Flextangles are paper models that can be flexed to reveal hidden faces. They were originally created by Princeton graduate student Arthur Stone in 1939 and became a huge fad when Martin Gardner published them in The Scientific American years later. There is an incredible number of different flextangle types. The kids loved making them but BEWARE they require persistence, careful and very firm creasing and patience. Crease all the lines and dotted lines as per instructions very firmly and wait till the glue dries. Lots of kids thought their Flextangles weren't working but they were. You do need to ease them in on the first few flexes, and patiently work them till they are moving easily. How many vertices?How many edges? How many shapes? And of course - PROVE IT. A great introduction to the single sided Mobius Strip. Everyone will want to make one. Multiplication.com Don't cave in when it comes to learning the times tables. Start digging your way to multiplication mastery. Great site to learn multiplication tables with games. Check out the iPad friendly online Games at this site and the Multiplication mastery videos and ideas. Khan Academy Khan Academy Watch the VIDEOS at this site and then then the practice sections - they also enable you to write on the screen. Googol and Googolplex We're talking pretty big numbers here... And an interesting idea about what it'd be like traveling in a Googolplex-sized Universe! IS A PICTURE WORTH A THOUSAND WORDS OR A MILLION OR A BILLION? Ever wanted a new spin on Graphing - well here is. Google Labs' Ngram Viewer. It's an addictive tool that lets you search for words and ideas in a database of 5 million books from across centuries. When you enter phrases into the Google Books Ngram Viewer, it displays a graph showing how those phrases have occurred in a corpus of books (e.g., "British English", "English Fiction", "French") over the selected years. Let's look at a sample graph - Here is a graph from someone studying various forms of frustration from the one 'a' argh to the 4 'a' aaaargh. Erez Lieberman Aiden and Jean-Baptiste Michel show us how it works, and a few of the surprising things we can learn from 500 billion words. IN THIS TED LECTURE - (suitable for stage 2 up particularly the back end of the Lecture). Why do YouTube views freeze at 301? Numberphile pays a visit to YouTube and learns the secret behind one of the website's famous idiosyncrasies - why view counts on new videos often freeze at 301. The Monty Hall Problem is a brain teaser based on the popular game show, Let's Make a Deal. doors in order to find the car amongst the goats. This is great one to act out with your students. HexaFLEXagons take a look at the Video. In geometry, flexagons are flat models, usually constructed by folding strips of paper, that can be flexed or folded in certain ways to reveal faces besides the two that were originally on the back and front. How to make a Hexaflexagon - instructions here. Black line template for Hexaflexagon, Hexaflexagon Folding Instructions and also template upload for images for Personalised hexaflexagon. 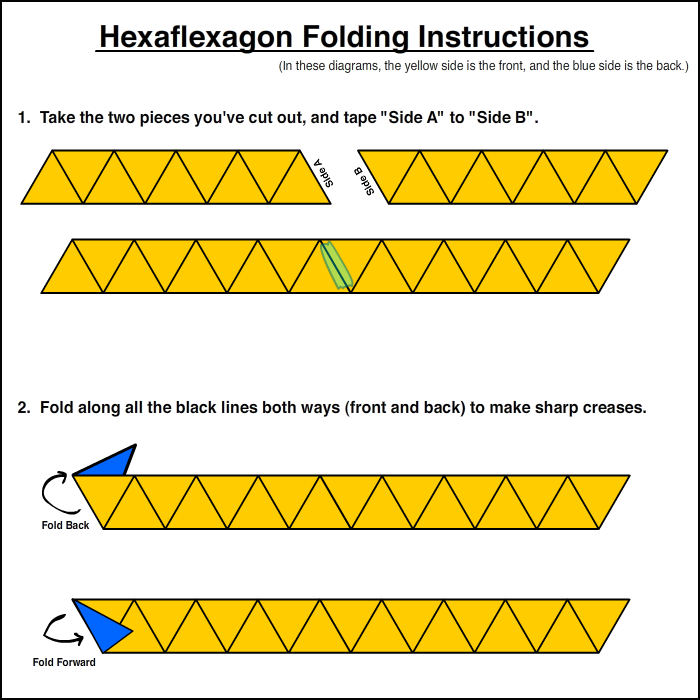 Simple WIKIHOW instructions for folding a hexaflexagon. Math Improv: Fruit by the Foot Playing mathematically with fruits by the foot. Maths is more important to the world than in any other time in history. From rockets to stock markets, many of humanity's most thrilling creations are powered by math. So why do kids lose interest in it? Conrad Wolfram says the part of math we teach -- calculation by hand -- isn't just tedious, it's mostly irrelevant to real mathematics and the real world. He presents his radical idea: teaching kids math through computer programming. WolframAlpha answers questions that people might have not by searching available knowledge but by computing using built in knowledge and details, and providing new answers to specific questions. Check out the general examples page to get some ideas. See what amazing results you get when you just type in your first name - you will love it. Mathematician Marcus du Sautoy takes you inside the universe’s native language — symmetry. Fabulous TED talk on Symmetry - great for upper primary and secondary. From beautiful upside-down columns to the mind-boggling number of symmetries in a Rubik’s Cube, he shares some of the brightest (and darkest) moments in the history of humanity’s fascination with symmetry. Professor Marcus du Sautoy argues that mathematics is the driving force behind modern science. Ten fifteen minute podcasts that reveal the personalities behind the calculations from Newton to the present day. How do these masters of abstraction find a role in the real world? Fabulous. Illuminations latest edition is Calculation Nation and play some really interesting mathematical games that require thinking and concentration rather than just calculation. You can play against other online gamers once you register but test it out as a guest. What has mathematics got to do with beauty? Actually, a lot. Physical attraction depends on ratio. Our attraction to another person's body increases if that body is symmetrical and in proportion. Likewise, if a face is in proportion, we are more likely to notice it and find it beautiful. Pi has excited mathematicians for thousands of years. Why all the interest? Australian Coins Lesson 2 This video shows the different ways of writing an amount of money. How to write money in different ways. Printout Money worksheets including realistic coin and note manipulative in Australian Dollars and many other currencies. Mathematicians define "tessellate" as covering a plane with a pattern, and it is a concept that interests scientists and artists, as well as mathematicians. Marjorie Rice discovered four new tessellating pentagons in the late 1970's. tessellated dancers dance. Next, visit Nakamura's Jigsaw Puzzles reassemble tessellated cats, pigeons, gorillas and more. M.C. Escher,the Dutch artist and father of modern-day tessellations. Includes many of his images. This Math Forum page is a great introduction to tessellations. Draw your own Tessellations Great tutorial. Use some thickish paper approximately 100 x 100. Great video for stage 2 and over. For 2D shapes and 3D platonic solid - tetrahedron, cube, octahedron, dodecahedron, or icosahedron, a polytope is regular if all of its elements are alike. MathTacular3-What's Your Angle - Great Youtube Video on Human angles. 3D Shapes Great site great info great video. "The Revenge of the Triangles"
Augemented Reality 2D nets to 3D shapes - Fabulous. Download App iClass Shapes + download the PDF for the shape. Just play with the interface or download the lesson. A famous mathematics story, I just love it. "Be patient, for the world is broad and wide." Ask Dr Math Your problems you never have to have a problem you can't solve again at Swarthmore. This is a great place to investigate. And you can get a weekly BEATCAL email giving you the great maths trick of the week. NRICH Enriching Mathematics site has age appropriate problems and this site also has a news letter and many other links - well worth a look. Translates into hieroglyphics, does mathematical calculations online, excellent site. Includes 16 other terrific interactive Ancient Egyptian activities. Interactive Maths K-12 deals with all strands of maths with simple manipulative java scripts. AAA MATH Hundreds of pages of Basic Math Skills. Interactive Practice on every page. An Explanation of the math topic on each page. Several Challenge Games on every page. Jump Start for Kids - great site for resources in Maths and Reading particularly for parents.